SWAMP is pleased to release a new report on the Species-at-Risk in the Slocan Watershed. The report summarizes the species-at-risk that the SWAMP field team identified during the 2014 and 2015 field seasons. These observations were mainly incidental in that while we were actively identifying all the species of flora and fauna in wetlands are riparian areas, we were not specifically searching for rare species. The type and extent of species-at-risk in the Slocan Watershed is currently understudied. Current data (October, 2015) in the BC Conservation Data Centre (CDC) lists 20 occurrences of species-at-risk in the Slocan Watershed. One of the occurrences, crested woodfern (Dryopteris cristata), was observed and submitted during the 2014 SWAMP field program. Eight of the 20 records are over 30 years old and their current condition and viability is unknown. No ecosystems-at-risk have been identified in the watershed. 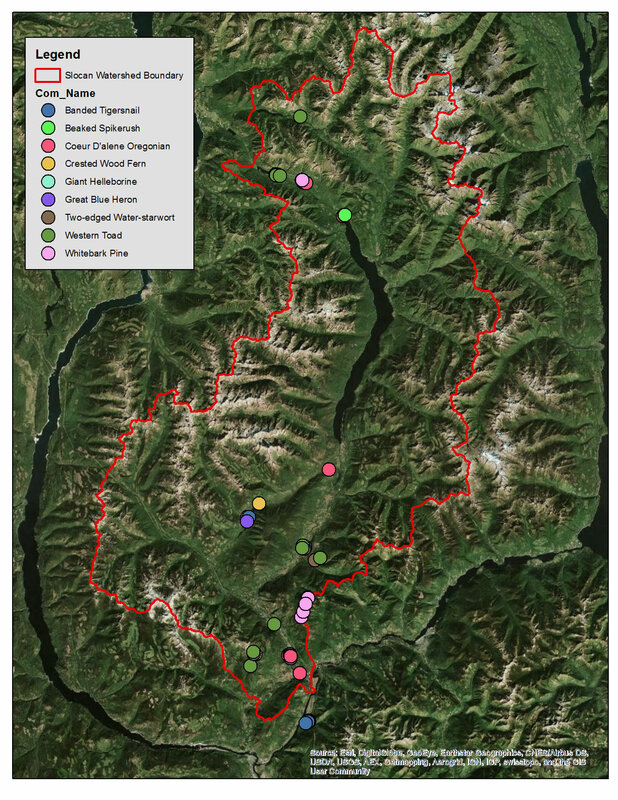 During the 2014 and 2015 SWAMP field seasons biologists identified 8 species-at-risk in 56 locations in the Slocan Watershed, as well as 5 locations outside of the watershed. Some of these locations would constitute groups of individuals or sub-populations that would be combined by the CDC into single Element Occurrences (EO). Some were targeted surveys while completing wetland inventory plots and others were incidental sightings while traveling to and from wetlands. In addition to species-at-risk tracked by the CDC, we identified multiple locations of fungal species that are either new to BC, or have very few known records (pers. comm. Kroeger, 2015). As fungi have yet to receive official conservation status designations, the species we identified are assessed in terms of relative frequency of occurrence based on expert knowledge. Voucher specimens were collected for all fungal species and submitted to the UBC herbarium to add to the provincial data base. This work will support future initiatives to assign conservation status to fungal species. We also identified multiple wetland ecosystems that are considered to be ecosystems-at-risk in other biogeoclimatic subzones. Recent discussions with CDC staff indicate that they are interested in these data and our submission may lead to having them ranked as listed ecosystems in the Slocan (pers. comm. Stacy, 2015).